It seems like the winter weather just won’t stop! There’s been one snowfall after another here in the Northeast… and it got us thinking about how to best outfit your staff during inclement weather. You don’t want your front desk, country club, or security staff to look anything other than totally put-together—no matter what’s going on outside. That’s where the selection of hospitality outerwear here at Averill’s Sharper Uniforms comes into play. Whether you need them all year round or just during the colder months, these hospitality sweaters, jackets, and other stylish outerwear items will have your entire staff looking and feeling great. Imagine this: Guests walk up to your country club in the middle of the winter. They see one of your staff members standing at the door—wearing whatever jacket he happened to find. Is that the way you want your business to represent itself? We didn’t think so. Now you don’t have to worry about keeping up appearances in cold weather. Simply choose the men’s outerwear, women’s outerwear, and hospitality garments that best suit your business. 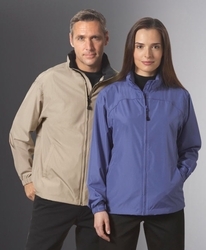 Our hospitality outerwear is available in a wide variety of colors and styles, so you’ll be sure to find exactly what you need here at Averill’s Sharper Uniforms.